Ask fellow campers about "Blue Heron Campground (formerly Gothenburg KOA)" and nearby attractions. Nature! We RV because we love nature. The Blue Heron is an old resort but, despite its age, it's neat and clean. It is in a heavily wooded area with giant cotton wood trees, flowers and birds everywhere. It's set along a little tributary of the North Platte. If you want fancy, this is not it. If you want a concrete parking lot, this is not it. But, if you want nature, you will enjoy the gorgeous natural setting. We camped at Blue Heron Campground (formerly Gothenburg KOA) in a Motorhome. Requested a 50 amp service site. Assigned a site. This site had had electrical problems 3 days prior as per electrician and with drop and surge blew our refrigerator and microwave out! Electrician helped us find another site. Owners accepted no responsibility for damage due to "hold harmless" clause on email confirmation. Would not even refund our money. We camped at Blue Heron Campground (formerly Gothenburg KOA) in a Fifth Wheel. Enjoyed the Sod Museum and Pony Express Museum. Needs a lot of care. Bathroom had dead bugs against the walls, showers had mold on them. Water was hot, pool was not filtered and leaves and cottonwood floating in it. Wifi was ok. Would not stay again, outdated and needs repair! Picnic table was warped. Too bad because it is right off the freeway which is nice! We camped at Blue Heron Campground (formerly Gothenburg KOA) in a Travel Trailer. This park left much to be desired and is in need of some serious renovations: The pool water was green on one side, 1 of 2 filters was not working and debris was strewn all over the surface. The internet was non existent or so slow (less than 0.2 meg/sec) that it was unusable. If a service offered is unusable, then it should not be offered. The playground was old and rusty with a wooden teeter-totter and a rusted slide from the 1970's. The fence had just been repainted in the bright KOA colours. We were not escorted to our site. This seemed unusual to us as most KOA campsites offer this service and upon arrival can immediately address any concerns. The check-in staff was friendly but the front desk was so far from the campsites and we only stayed overnight that we simply packed up ASAP in the morning and departed hastily. We camped at Blue Heron Campground (formerly Gothenburg KOA) in a Travel Trailer. We've trusted KOA and visited more than 10 on this two month cross country trip. This KOA is by far the worst we've found. The shower heads were clogged, the dumpster was open and full, the pool was green and dirty, and we saw no KOA staff in the campground during our visit. The office is really a convenience store associated with a gas station, and the KOA tag doesn't seem warranted or appropriate. I would avoid this campground and will not camp here again. We camped at Blue Heron Campground (formerly Gothenburg KOA) in a Motorhome. The park is old, swimming pool was drained, no info given about wifi, very tight pull through sites. Ground is dirt/gravel with standing water in places. Old swing set with slide and wooden teeter-totter. Bathrooms need serious updating. Railroad tracks nearby and trains were going through during the night. The number one reason we would never stay here again is the people in this town are rude, from the teenager doing donuts and almost sliding into us, to the people blocking the entry ways as they stop to talk to each other in their cars. Way over priced and not welcoming by the town or the campground management. We camped at Blue Heron Campground (formerly Gothenburg KOA) in a Travel Trailer. Very overpriced and the facilities are old. While the bathrooms were clean, they need updating really badly. The sites are tight, and there is nothing but dirt around the grounds. We will not stay here again. We camped at Blue Heron Campground (formerly Gothenburg KOA) in a Fifth Wheel. Typical KOA. Sites pretty close together. Wi-Fi went down and could not get AT&T signal and poor Verizon so out of luck for being online. No help to fix from the front desk. Location close to the highway so you do get highway noise. We camped at Blue Heron Campground (formerly Gothenburg KOA) in a Travel Trailer. Nice little park under the trees. Rate if for a 50 amp and water site, no sewer, with a KOA card. Site was plenty long for my 39' coach with toad, and very,very wide, grass on both sides of gravel. Several wild turkeys wandered through the site. English hosts are very friendly and accommodating. The store is stocked with many British items and my British Bride spent a small fortune there. We transit this area often,and this will be our stopping point. We camped at Blue Heron Campground (formerly Gothenburg KOA) in a Motorhome. An adequate campground for an overnight stay. The pool is not operational and the internet was erratic the night we stayed there. Maneuvering a large rig could be a challenge but doable. We camped at Blue Heron Campground (formerly Gothenburg KOA) in a Travel Trailer. What a missed opportunity and overpriced facility. First, the missed opportunity: This is a nicely laid out property with older trees for shade. However it looks like it has been totally ignored for the past few years. It looks like whoever owns it now has decided to do the bare minimum as far as upkeep and the grounds. The swimming pool is closed (89 degrees while we were here) and weeds are the flower of choice. This is one of those places where you think to yourself "what if" and wonder why anyone would let it deteriorate. Now, for the overpriced: We paid $41 for full hookups (which are only 30 amp) and at best this is only a $25/night facility. But, for a one night stop it works - just not for $41. We probably won't stay here again. P.S. KOA needs to check this place over and see if it meets their criteria. Doubt it. We camped at Blue Heron Campground (formerly Gothenburg KOA) in a Fifth Wheel. This campground just re-opened recently after being affected by the severe flooding this summer in the area. Yes, the pool was not open but that is not what the owners have been concentrating on at this time. Installing a new bridge to the campground was. 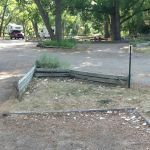 They are continually working to improve their campground. They have new picnic tables on the sites. They have nice cabins and a playground for children. I assume that they are under considerable financial pressure without the usual income from campers during the period in which they were closed. We stayed in the campground for 5 nights. Others we spoke with in the campground stayed several nights as well and they enjoyed it too. The bathrooms and laundry were very clean and well kept. The owners were very accommodating and we would not hesitate at all in going back to this campground. In fact the next time we are in the area we will stay here. We camped at Blue Heron Campground (formerly Gothenburg KOA) in a Fifth Wheel. This place is dirty! When you walk the grounds and enter your travel unit you bring the muck on your feet left from a flood this summer. There is slime and rotting smell hanging over the campground. The pool is FILTHY. I would say they opened too soon after the flood but from previous posts it was bad before and now is only worse. I would suggest avoiding this one! We camped at Blue Heron Campground (formerly Gothenburg KOA) in a Motorhome. Are you affiliated with Blue Heron Campground (formerly Gothenburg KOA) ?